Childhood hobbies can morph into hard-core adult pursuits -- maybe as a boy you traded baseball cards with the fat kid down the street, but now your investment-grade collecting's gonna put your own fat kid through college! Or at least Tech. 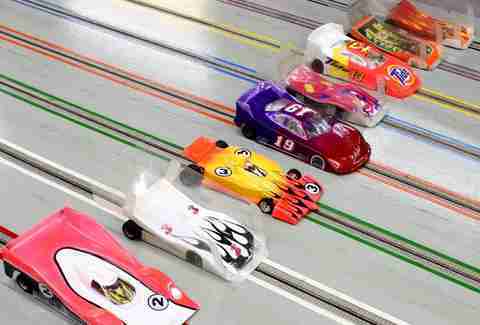 Getting serious without losing the fun, Dallas Slot Cars. A labor of love from hubbie-&-wife convenience store owners, DSC takes slot cars out of the basement, and into an enthusiast's mecca, with multiple tracks, multi-class league races, purchasable vehicles, full-service parts & maintenance, even custom paint & decal jobs from "Sprays By Mac" -- also the name of a movie Macaulay Culkin doesn't want you to see. The lilliputian whips are metal-framed, flex-plastic-bodied, rubber-tire'd darts that hum like bumble bees thanks to tiny electric motors no bigger than a 9-volt battery; despite that, the cars can fly, whether it's NASCAR/Indy-look "scale" models that can hit 60MPH, or 100MPH "wing" cars -- basically curvy spoilers on wheels, or what racing purists think of Danica Patrick. 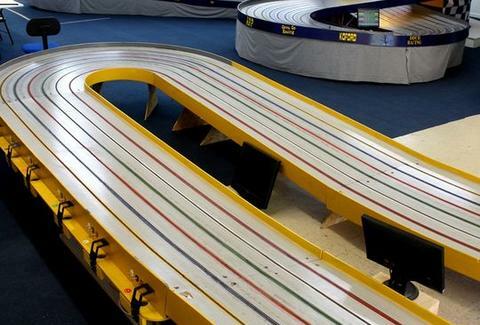 The fastest track, which you must earn the right to race on, is the 155ft, 6-turn, 8-lane "King", electrified by power-conditioned 12v marine batteries and equipped with computerized lap timers accurate to 1/1000 of a second; beginners can rent scale cars to run/wreck on a smaller but still challenging oval, or go absolutely basic with the "HO" track, an up-leveled version of the classic your dad probably played with. Yes, your dad played with HOs. DSC's weekly races are broadcast live on the 'net, complete with real-time lap splits, video, and chat -- a service that allows you to pursue adult relationships while hiding the fact that the fat kid down the street is you.